For me, books are best consumed one at a time, and I will be spending most of my summer digesting Putting Amazing Back Into Grace: Embracing the Heart of the Gospel. Horton does an excellent job of communicating the foundation of reformed doctrine in such a way that it can be presented at a “layman’s level” conversationally. Sharing this book with my wife has been beneficial to both of us and has opened the door to others who are truly seeking to know Christ in “truth, the whole truth, and nothing but the truth, so help us God”. An increased appetite for God’s word has also been a bi-product of this book, which is why I proudly recommend it to you. 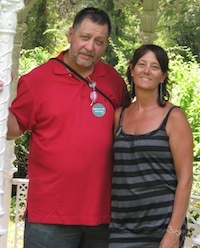 Glenn is a member of Redemption Hill Church in Richmond, Virginia, and is married to his wife of 30 years Rene. Together they have three kids: Madison, Maiya, and Britain. He loves to restore antique cars, and listen to antique music. His idea of a perfect day includes roaring fires, rainy days, a couch full of family, and homemade chili. He also receives personal satisfaction from watching the USC Trojans beat Notre Dame, further evidence of Glenn’s sinful nature. When he’s not working on his John Wayne impression, he and his family can be found in the Mechanicsville Community of Redemption Hill. Thanks Glenn, I will have to check out the Micheal Horton work. Thanks Glenn, I will have to check out Michael Horton’s work provided here.